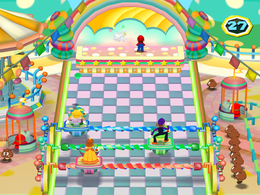 Stage Fright is a 1-vs-3 minigame in Mario Party 6. Its name comes from the term "stage fright", which means fear of performing in front of a crowd. The three players attempt to hit the single player with the balls shot out of their cannons, though he or she dodges their projectiles. The point of the game for the three players is to knock the solo player off the stage by shooting different colored balls at the solo. The point of the game for the solo player is to avoid the balls for 30 seconds. The three players are in rows, making it possible to hit one of their teammates, stunning them. The cannons all move automatically; the first player's platform moves the slowest and the last player's platform moves fastest. If the three players win, their three cannons line up in a certain formation and the players do their victory animations. If the solo player wins, he or she does his or her victory animation, while the three players do their losing animations. Rules – "Three players on moving platforms fire balls at the stage. One player has to run around the stage to avoid getting hit!" Advice – "Players on platforms who are hit by their own teammates will be temporarily stunned." Three-Man Sharpshooting 3 ninde neraiuchi! This page was last edited on January 16, 2018, at 13:20.